It doesn't seem that in vitro or stem cell research have the same negative vibe among the populace as does abortion. Is it because of the "good" that comes out of them? Yah, probably (to the above comment). Plus, I believe the acceptance of in vitro fertilization (in which the goal is to create a new life, therefore doesn't hold same stigma as abortion), helps the acceptance of stem cell research. Essentially the argument goes that if only embryos created for in vitro are used, then it is OK because the embryos weren't created simply to be destroyed, but would be destroyed anyway, if that makes sense. 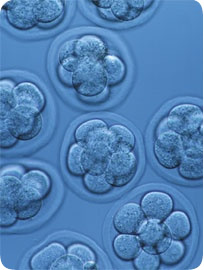 Plus, while the majority seem to believe life begins at one of three times (conception, viability, birth), there are some people who make arguments for other times (implantation, beginning of brain development), which might lead them to oppose abortion but have no problem with in vitro or stem cell research. Some might make the case that you could morally support stem cell research on embryos even if opposed to abortion given that the life has already been ended/will be ended anyway. so, to the "might as well make a positive out of a negative" argument, doesn't that support the negative act, instead of condemning it? I don't see how it is supporting the negative act (in the case that the actions are seperate). yes brent, in THAT case, the actions are separate, but it's also a way for people who have not yet made the decision to rationalize their decision by the fact that SOMETHING can be done with these created lives.